The Syrian Arab Army (SAA) troops in northwest Syria have been placed on high alert, as the buffer zone agreement hangs in the balance. Led by their elite Tiger Forces, the Syrian Arab Army has begun military drills and training exercises in the eastern countryside of the Idlib Governorate this week. The military drills were overseen by the prominent commander of the Tiger Forces, Major General Suheil Al-Hassan, who made his first appearance in the Idlib province this month. 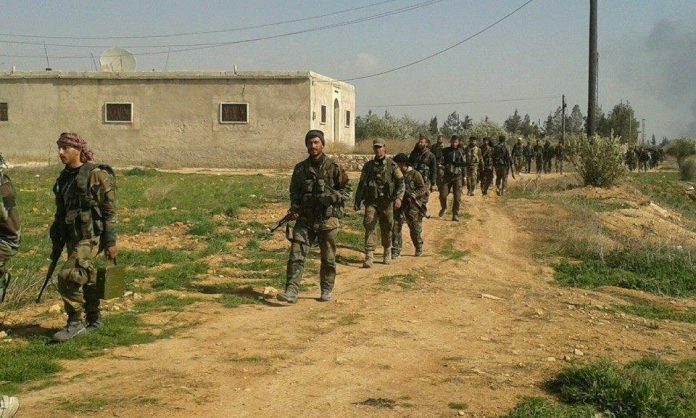 With the jihadist rebels refusing to leave the buffer zone, the Syrian Arab Army has begun mobilizing their troops in northern Hama and southern Idlib for a potential military operation against the opposition forces. While the 4th Division has been redeployed to southern Syria to help with the Islamic State offensive, the Tiger Forces and Liwaa Al-Quds have remained near the Idlib front in case the jihadist rebels refuse to leave the buffer zone.